Hello blog friends. Guess what? Well, I had the wonderful opportunity to meet up with another awesome blogger! 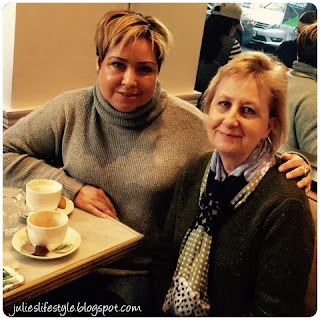 I met up with my newest blog friend, Janet who blogs at Rosemary & Thyme! 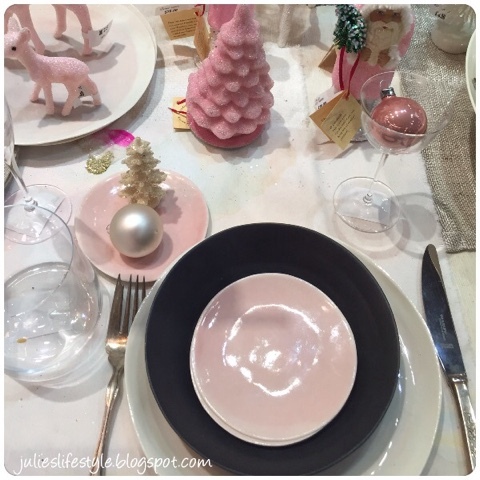 Janet has the most beautiful blog where she shares about entertaining, tablescapes, and recipes. We both arranged to meet this past Saturday in New York City, at the French restaurant called Maison Kayser. Here we are together enjoying our lunches. Janet is on the left and I'm seated on the right. We both had salads and quiche, and then lattes. We both enjoyed spending time getting to know each other and sharing about our blogging experiences. We had so much fun together that we decided to do a little bit of window shopping. We visited Fishs Eddy and then ABC Carpet and Home. I took a few photos while we were walking around ABC Carpet and Home. 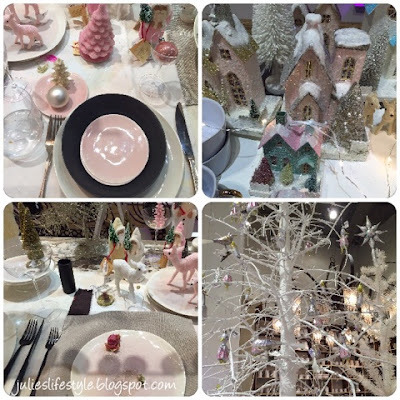 I really enjoyed looking at their holiday and Christmas displays. Their theme was pastels and pink colors. I love the colors of the plates and how elegant and it looks with the black accent plate. The little house ornaments and display were so beautiful but very expensive. Look at the pretty white tree and ornaments. I love the old fashioned ornaments. I love the pink deer and trees and the pink tea pot. There was just so much to look at! I just love the houses and bottle brush trees and they still seem to be all the rage right now. 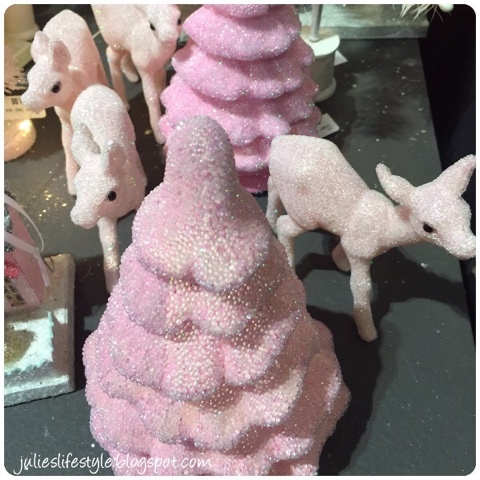 Maybe I have given you some ideas for decorating your house or trees this holiday season. We then went on to the bedding department and had fun looking around there too. Janet was also so kind and made me mini pumpkin muffins and I just love the packaging it came in. Janet is a talented baker and the muffins tasted so good! I love the pretty pearl napkin rings she made me too. Thank you Janet for our fun day together and for the goodies you made me. I enjoyed our meet up so much and I'm looking forward to it again! This was my fourth blog friend I was able to meet this year and I am so happy and thankful for the opportunity! Meeting blog friends is such a special and wonderful experience. I hope that someday you will be able to experience that too. 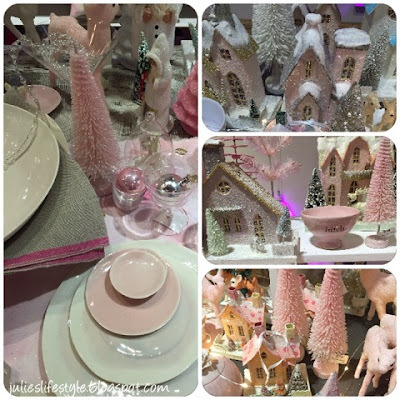 Don't forget to visit Janet from Rosemary and Thyme and her blog HERE! So good to be able to meet a blog friend! There are no buddy bloggers here I could meet in person. You're lucky! How fun! I will go and visit her blog as well Julie. I guess I am a traditionalist. I must have red and green at Christmas!! I am noticing a lot of people going more neutral in their holiday decorating. At my house it is like Buddy the Elf lives here..lots of Sparkle going on!! Another fun meet up! You're on a roll!! The lunch sounded delish and the window shopping, divine. I love those pink deer. SOOO cute! Yummy on the muffins too. How nice that you were able to meet another blogging friend. I'm sure she enjoyed your company and it looks like you had a lovely time. Enjoy your box of goodies. I think it is so wonderful to be able to meet fellow bloggers in person! The muffins look pretty tasty and what a lovely gift along with those gorgeous napkin rings! Thank you for sharing! Sounds like a fun day with a blogging friend! Meeting new people and making new friends is one of the greatest benefits of writing a blog. 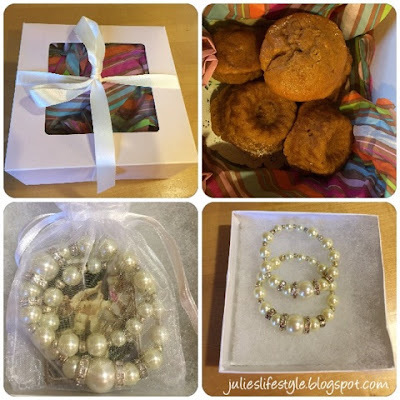 Julie- I don't know her blog at all but I will have to pop over and check it out. I am so thrilled you got to meet her. I have some bloggers I hope to meet this next year, too. So glad that you got to meet Janet. she is a lovely lady and has so much talent. Everything she does is so elegant. Sounds like you guys had fun shopping and taking in the sights of New York. You're really rockin' and rollin' Julie! I love ABC, but it's been at least two years since I've been. Plead to hear you had another fab time, and I'm off to visit Rosemary & Thyme now. You have so many wonderful blog friends that live near you Julie that you can meet up with. How sweet. Hi Julie, looks like such a fun time meeting up with Janet. Browsing the shops had to be extra fun. Yesterday I also met up with a blogger that lives locally and I just found her in blogland. We also went to a little French restaurant here and talked forever over a yummy lunch. Isn't it fun to meet up with blog friends? I'm meet two more in 2 weeks and looking forward to yet another great day. So glad you enjoyed your time with Janet and thanks for the link to meet her. Julie, how fun! Sounds like you had a great day - what could be better -- eating, shopping, and meeting a new blog friend! Heading over to R & T.
Julie it looks like you had such a great time with Janet. And who wouldn't love to have lunch in New York. I really like those pretty pearl napkin rings too. How fun you got to meet a fellow blogger and have lunch in NYC! How wonderful for both of you to meet up, Julie! You're having a good year of meeting blogging friends. The decorations you shared are soooo pretty and vintage looking. My mom used to have those sparkly houses and I don't know what happened to them! 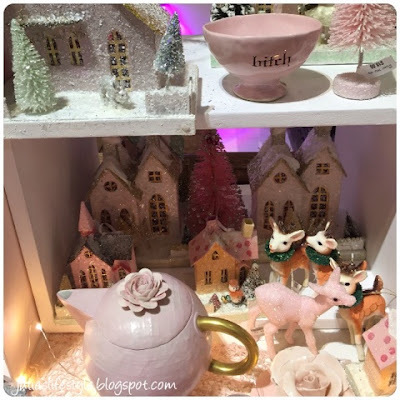 I loved all the pink...plates, deer, teapot, ornaments, etc. Fun!! Must be wonderful to catch up with fellow blogging friend. Seems like you guys had lots of fun:) Have a wonderful day! What a perfectly fun day you had together! And I love the peeks at Christmas decor - so pretty! Thank you so much for your sweet comment over at my little blog! Hi Julie. Sounds like a great friends day out. Thank you for visiting me. I'm your newest follower. Lucky you getting to meet a fellow blogger!! Thanks so much for sharing photos of this great place!! What a beautiful write-up Julie. It was certainly a pleasure to meet you. I had such a wonderful time chatting and shopping with you. I am looking forward to our next gathering. Your pictures are beautiful I hope mine are just as pretty.